Synchronised Time Australia stands out as the Premier provider of NTP PoE and WIFI Analogue, Digital clocks and network based timing products. Australia wide local call access via our 1300 phone number – 1300 85 33 21. (1) Highly accessible local Australian based technical support. We stay up late or start in the wee hours working with our international suppliers to ensure your issues (the few that may evolve) are resolved effectively and promptly. (2) Full local Australian based product warranty with every effort made to stock products for advance replacement where agreed to or justified. (3) BEST pricing, passing on volume discounts for purchases greater than single quantity, notably improving with volume. We want our customers to benefit most affordably from synchronised accurate time technology. Our products utilise Power over Ethernet (PoE, only one network cable connection is required per clock) AND Wireless (WIFI) technologies. This allows the simplest deployment. Time and power is acquired from your network PoE OR where AC/Battery powered with wireless communications time is acquired wirelessly. We have many offerings that at a minimum all utilise NTP (Network Time Protocol) to ensure completely accurate time while offering benefits such as wireless and/or battery power. 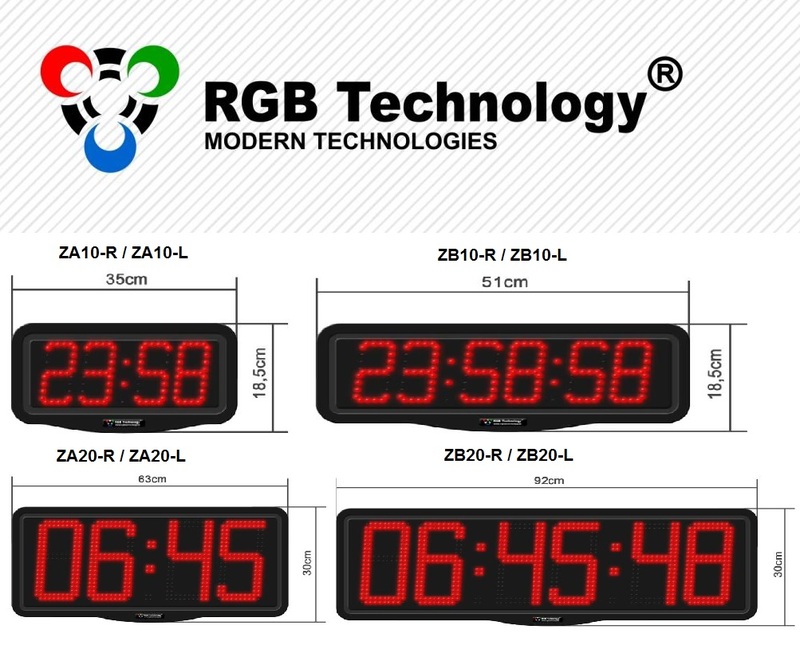 RGB Technology introduce a NEW range made in Poland of IP66 (Waterproof) 5cm, 10cm and 20cm NTP LED clocks – Click HERE for more information and pricing (2 Year Warranty). (3) Master / Slave operation with GPS time sync. 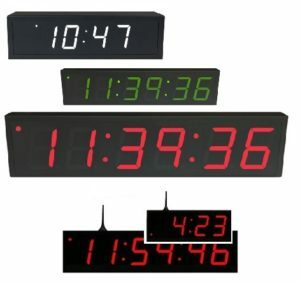 One clock acts as master (has GPS time sync) ALL other clocks are slaves getting accurate time from the ‘master’ – NO NETWORK connection required. 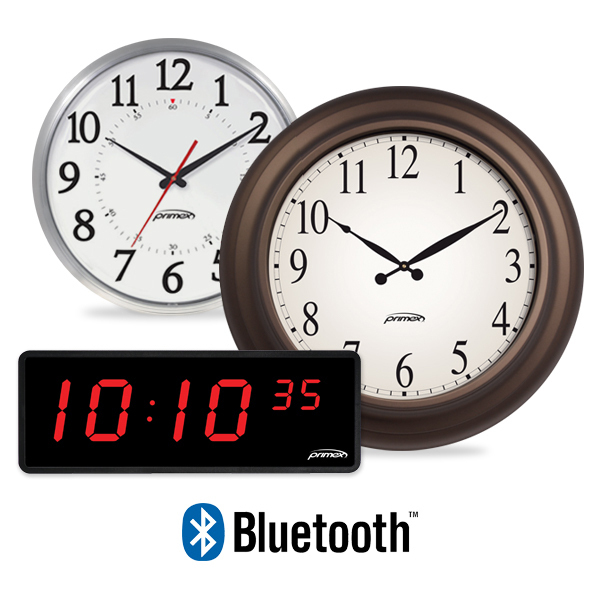 Primex introduce a NEW range of Bluetooth WIFI clocks made in the US – Click HERE for more information and pricing. 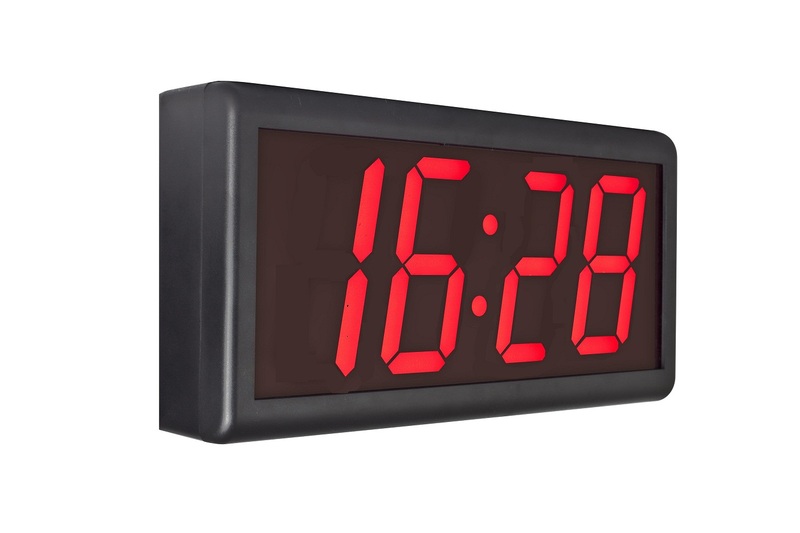 (1) Primex offer an extremely innovative clock solution in Analogue and digital utilising clocks communicating in a BlueTooth V4 mesh back to a single Bluetooth Ethernet Bridge requiring JUST ONE IP address. 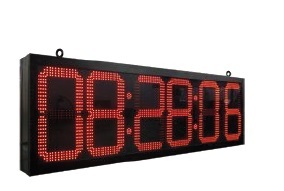 BT V4 offers up to 60 metres communication between clocks. NO EXISTING Wireless infrastructure is required with a VERY competitive 6 year warranty (2 Year Standard Warranty, 4 Year optional warranty extension to 6 year warranty). (2) Primex ALSO offer PoE clock solutions in Analogue and digital with a VERY competitive 5 year warranty (1 Year Standard Warranty, 4 Year optional warranty extension to 5 year warranty). ** Review this product HERE you wont be dissappointed. 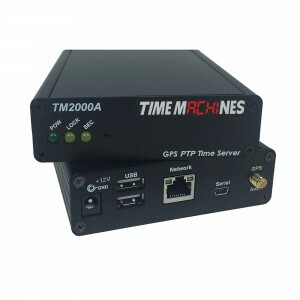 Time Machines have made yet further commitments to their product, building on the strength, quality and function of their PoE/WIFI Digital clock range AND Incredible value and function NTP/PTP Time servers. Strengthening their brand by returning to original ownership with a massive commitment to build product function and features of their 100% US made products – (1 Year Warranty, 2 & 3 Year warranty available as an option). (1) NTP servers featureing NTP/PTP support with OCXO crystal oscillator all at a VERY competitive price. Click HERE for more information and pricing. 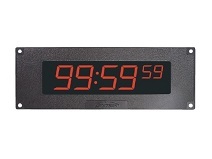 (2) A quality range of PoE and WIFI (2.4Ghz, 802.11b/g/n) Digital clocks. Click HERE for more information and pricing. Click HERE for more information and pricing (2 Year Warranty). 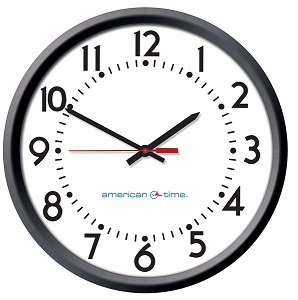 American Time have introduced very well-priced analogue PoE AND wireless 5 year battery powered timekeeping solutions that use 1 watt compared to the typical 13 watts. American Time also provide 2.5″ and 4″ digital timekeeping solutions in 4 and 6 digits. Click HERE for more information and pricing (1 Year Warranty). GlobalTime continue to provide the best value digital PoE product range NOW supporting time/text/calendar, temperature, humidity, bell/signaler functions for staff breaks or other regular event notification, as well as a countdown function. Inova Solutions continue to provide digital and analogue PoE clock systems going the extra distance supporting DHCP options and cloud monitoring (Inova OnTime Management System) for seamless installation and ongoing operation. Inova Ontime products are our longest term vendor providing quality solutions for the past 10 years. Our product and technology solutions have and continue to span a diverse range of industries, schools, colleges, universities, hospitals, emergency services, small to large enterprises and corporations. We understand the importance of effective technology in businesses. Ask us about PoE network switches for both copper and fibre network backbone AND GPS based NTP server solutions. 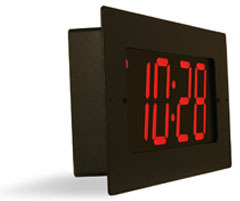 Please review our growing PoE clock/network solutions, as well as our analogue & digital clocks. Be assured we are completely conversant with these technologies and proudly showcase them due to their significant and tangible benefit to all areas of industry. 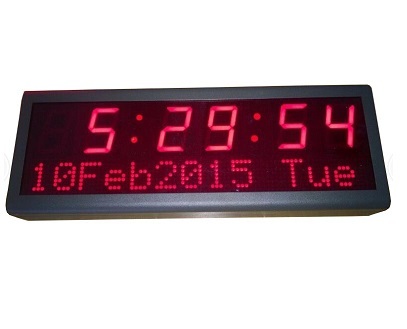 It’s possible that you may not find the PoE clock/network clock or device you are looking for in our range of time clocks offered in Australia. In this case, call us at 1300 85 33 21 or email us at enquiries@synctimeaus.com.au. We are happy to research and add new products as may become a specific requirement of a customer.